Burnley are confident they can still do a deal to extend centre back Ben Mee’s contract. The 28-year-old has one year remaining on his current deal, and could leave on a free transfer next summer, should he decide to see his contract out. 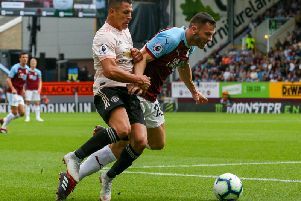 The club have been in discussions with the player’s representatives over recent months, but while they are yet to reach an agreement, they are hopeful they can come to a compromise at some stage and extend Mee’s stay at Turf Moor, with the empasis on trying to keep Mee, rather than cash in, even with an interest in West Brom’s Craig Dawson, for whom they have had a £25m joint offer, with Jay Rodriguez, rejected. As it stands, Mee remains one of three senior centre backs, along with James Tarkowski and Kevin Long, while James Dunne, who impressed on loan with neighbours Accrington Stanley last season, expected to join the trio on next week’s training camp in Cork. Mee joined the club, initially on loan, from Manchester City in the summer of 2011, before signing a permanent deal in January 2012, along with his former City youth team colleague Kieran Trippier. He has made 246 appearances for the club, many of which came at left back, before moving inside to his preferred centre back role for the second half of the Championship-winning season of 2015/16. And he can consider himself unfortunate not to have joined his centre back partners Michael Keane, who left for Everton on a record deal last summer, and James Tarkowski, in earning an England call.